(Reuters) – IBM (NYSE:) Corp’s $34 billion deal to buy Red Hat Inc (NYSE:) drove shares in the small but fast-growing software maker about 50 percent higher on Monday, reflecting the huge premium IBM is paying to ward off any potential challenger bids. 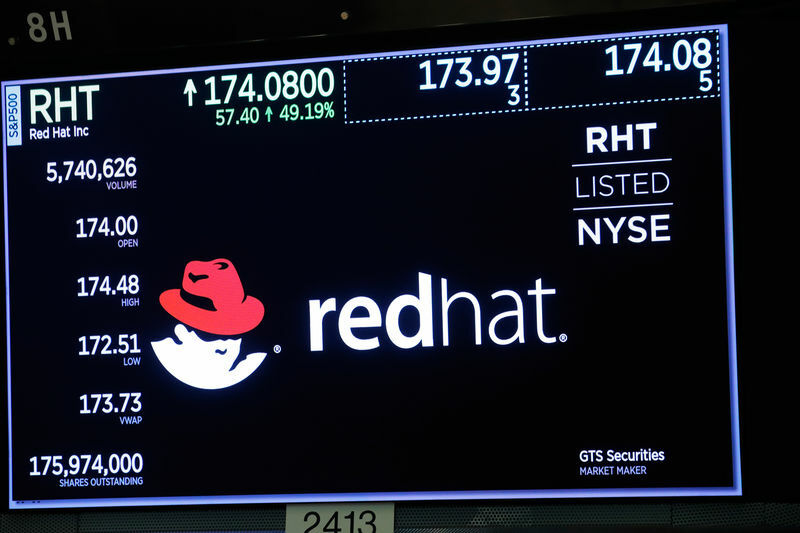 At $172, shares of Red Hat were still trading around $18 short of the $190 price agreed by the two companies in Sunday’s announcement, and analysts said that pointed to some remaining nerves among investors over the chances of the deal closing. The breakup fee for the deal, which would be among the largest on record in the tech sector, has yet to be announced and a high fee would also deter Red Hat from entertaining other buyers. IBM’s stock was down 2 percent on news of the deal, a hint that investors were concerned that, at 10 times 2019 projected sales, it had overpaid for the deal. The company’s Chief Executive Officer Ginni Rometty told CNBC in an interview aired early on Monday that she felt the deal was done at the right price. “This is a very fair price…(Red Hat CEO Jim Whitehurst) has built a great company, and unlike others, high growth, high profit and cash and so this is why I think really those are important things for our investors,” Rometty said. One brokerage, Stifel, raised the prospect of a competing offer from one of the other major players in cloud computing for whom the deal represents the emergence of a more substantial rival. “Google (NASDAQ:), Amazon (NASDAQ:), and Microsoft (NASDAQ:) (and potentially Oracle (NYSE:)) have the strategic motivations and financial resources to consummate such a transaction and would not be surprised if we were to see one of them make a competing bid,” analysts from Stifel said in a note. Rometty told Reuters on Sunday that the increasing use of cloud services from multiple providers was the driving force behind the deal along with the rise of the so-called hybrid cloud, in which companies run some of their software in their own data centers and other elements of it in data centers run by IBM, Amazon Web Services or Google Cloud, among others. Red Hat has been investing heavily in tech tools such as so-called “containers,” which make it easier for businesses to split up their computing work among a mix of data centers. But the combined entity will also sell software that runs on its customers own hardware and other clouds. That will put it in direct competition with firms like Microsoft, which has a similar mix of software and cloud services. Jim Whitehurst, the CEO of Red Hat, said the use of multiple clouds has been an advantage for Red Hat. Cloud providers such as Amazon often offer a house-made version of the Linux operating system for free or at little cost. But that version of Linux is available only on Amazon, and if the business wants to run software on another cloud they would have to ensure it works with a different version of Linux there. Red Hat offers a standard version of Linux that runs on commonly available clouds as well as a business’s own data centers, and Whitehurst said Red Hat customers were increasingly running its operating system on public clouds. IBM reiterated on a conference call on Monday that Red Hat would continue to be led by Whitehurst and Red Hat’s current management team. It also intends to maintain Red Hat’s headquarters, facilities, brands and practices.